If you're wondering what this event is all about, click here to see the post explaining it all! Amanda Hocking is the USA Today bestselling author of the Trylle trilogy and six additional self-published novels. After selling over a million copies of her books, primarily in eBook format, she is widely considered the exemplar of self-publishing success in the digital age. Yeah, you read right. I've been a HUGE fan of Amanda Hocking for almost a year and half now. I read her books way back when they were self-published (thank you Amazon!) and I just got my Kindle then. I wasn't even aware of the book blogging community or even Goodreads back then. Well, I've come a long way and I think the word 'thrilled' wouldn't be enough to express how excited I am to have her on my blog today. If you had to describe Wake in two words, what would they be? What inspired you to write about mermaids? Any particular reason? When I was a kid I was obsessed with Greek mythology, and I had an idea floating around for a series that involved sirens. I think I’ve always wanted to be a writer. I went through a phase in high school where I didn’t want to have a career as a writer, because I decided that writers were “boring.” Other than that, I’ve always been writing short stories/poems, so I think other than in high school, it’s always been something I wanted to do. Do you base your writing on your own past experiences? No, nothing in my books is completely based on what person or event. I think I draw from experiences I’ve had, and people I know, but every character is basically a mix of different things from different people. 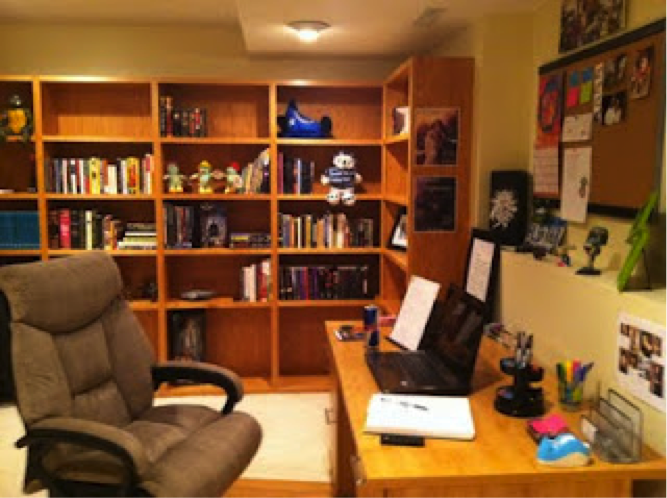 Where do you usually like to write or read? 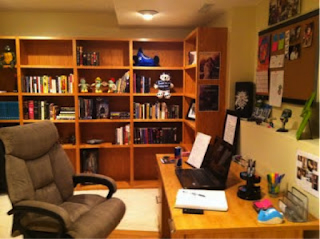 I do all of my writing in my office, and all of my reading in my bedroom. What are some of your favorite books that you’ve read recently? I just finished reading Invisible Monsters Redux by Chuck Palahniuk, and that was really good. I’ve also been re-reading a lot of my Batman comics, to get ready for THE DARK KNIGHT RISES. In the future, will you write for different genre for your books? I think so…I don’t know how far into the future that will be, because I’m having a great time writing what I am now, but I do have quite a few ideas for other things. 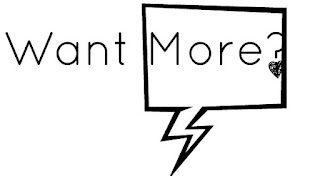 What is one thing that you can’t do without when you’re writing? Music is definitely a must…I need to listen to music when I write. At the end of every book, I make a soundtrack for the book based on the songs I listened to the most while writing it, and put that up on my blog (if anyone ever wants some background music while they’re reading.) Other than that, depending on how late I start, I almost always have a can of Red Bull with me as well. How is the writing process for you? Do you sit and write until you are out of ideas or do you set a schedule for yourself? I think it’s a combination of both for me. I do a lot of outlining before I actually sit down to write, so that the writing part can go as quickly/smoothly as possible. Then, when I’m writing, I usually start at night, and stay awake as long as I can. Any favorite movies and shows? Do you get any inspiration for your books from them? Oh, I have tons of favorite movies and shows. I watch way too much TV. Big Brother just started up, that’s always fun. Other than that my favorite shows are probably Dexter, SouthLAnd, and Judge Judy. So far none of these shows have made it into a book, but you never know. 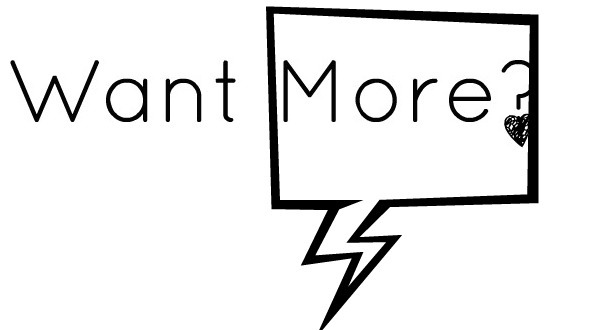 What are your plans for the next book? Different genre, a standalone or a series? The next book I’ll be working on is Elegy, the 4th and final book in the Watersong series. I’m excited to start on that, and see what comes next. Thanks Amanda, for taking the time to answer my questions! Make sure you guys add her latest book, Wake (WaterSong, #1), to your TBR! 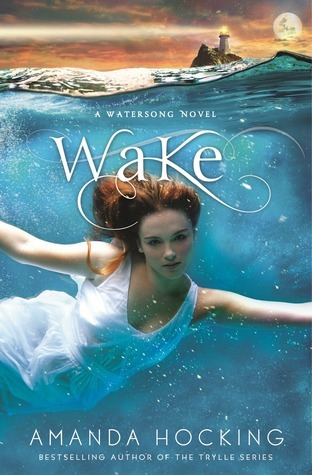 Wake (Watersong #1) by Amanda Hocking. Publication : August 7th 2012 by St. Martin's Press. Giveaway ends on August 15th, 2012.
a Rafflecopter giveaway Make sure to come back every day until July 31st to check out the rest of the posts of The Summer Book Talk and also, for a chance to win some fabulous prizes! Don't forget to visit Maji Bookshelf and Books Of Amber and check out their posts as well! I would love to be a mermaid. When I was a child, my favorite movie was the Little Mermaid. And it would be totally amazing to swim in the ocean. Be friends with fish and live in under water kingdom. Great interview. I like the idea of being a mermaid! I'm a Pisces - so why wouldn't I?! I'd like to be an Angel! I love angel books! Or mermaid! I would want to be a werewolf. I'm thinking maybe a shapeshifter - Bird/horse/dolphin/man, you know maximize my options. I would like to be a vampire because they are immortal. Who doesn't want to live forever? I don't know. Shape shifter I think! I would like to be a shape shifter. I would want to be a shape shifter or a angel?? A faerie might be nice. I'm already good at not lying! I would probably be a faerie or something that could read minds! Thanks for the giveaway! I would love to be a Faerie. I mean, not much is known about the Faerie-kind, so it would be nice to explore the powers of a Faerie. Werewolf. Just seems like I would be one, I suppose. I wouldn't mind being a shapeshifter I think. I would like to be a mermaid! To live in ocean and to travel all over the world. OMG, amazing question - Angel, definitely! Faery I guess?! I wouldn't want to be any of them though! If I could choose one thing to be, there is no doubt. I would want to be a faerie. i wanna be a shape shifter with bird type!! I'd have to say a Faerie because I don't think I'd be able to bite into other people if I was a vampire!! A mermaid because who doesn't want to be a mermaid?? I would like to be a vampire. I totally would've wanted to be a faerie, possibly of shadow court or dark court. Thanks for the chance to win! Great interview! I really love Amanda Hocking's books! I'd want to be a witch! And go to Hogwarts, of course. GRIM REAPER ALL THE WAY!!! XD I cant wait to read this! i would want to be a mermaid or vampir..